2nd Dec 2016 - Still got my nursing hat on! We have progressed this week, but Mrs EAM is still moving slowly..........not sure I was cut out for Nursing, but when its the lady you love, its surprising what you are capable of! As The English Apple Man has been pretty much housebound this week, the Journal contains some 'dispatches from my friends' - the first is from my young friend Vikram Singh Thakur; Vikram was in Bolzano last week for the biennial INTERPOMA trade show. The EAM would have been there, but Mrs EAM's surgery took precedence! 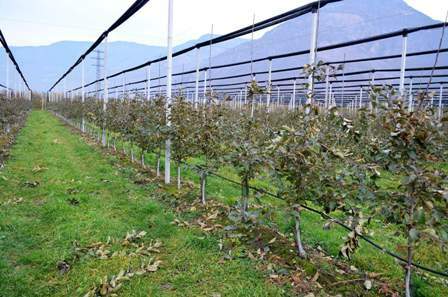 Vikram works for a multinational oil company, but is so passionate about his father's fruit farm at Shimla in the Himalayas and takes every opportunity to research Global technical and scientific progress in the apple industry. "When I headed to Bolzano (Interpoma) on my own, I wasn't sure what it would be like to not go with a group. 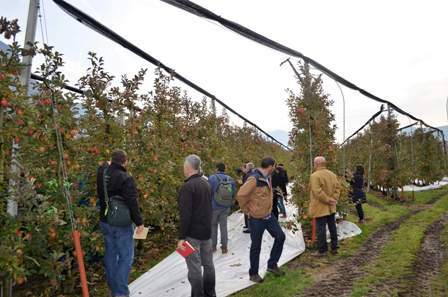 I booked three Interpoma tours to orchards and sorting/storage/cooperative facilities to make it worthwhile. In hindsight, I am glad that I booked those tours because the diversity of people on the tour was amazing. "First stop at Kurmark cooperative and a nearby farm - Nothing dramatic here but a very tight operation with high precision growing. 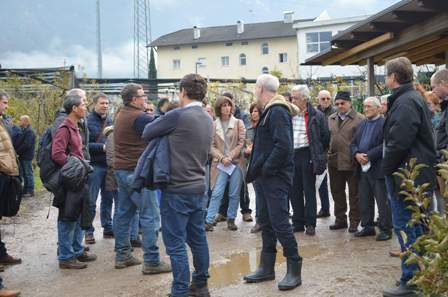 Second stop - Grufrut Group (coop) in Bronzolo with a farm visit to Helmuth Hafner's orchard. 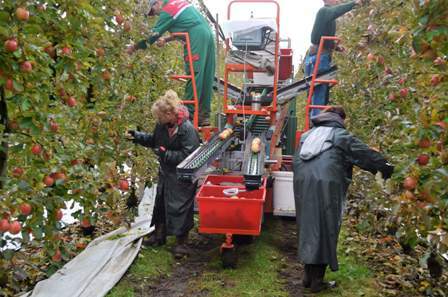 A very well managed Pink Lady orchard with average yields of over 90 tonnes/hectare over the last few years. Luckily they were still harvesting as it was last day of harvest window. 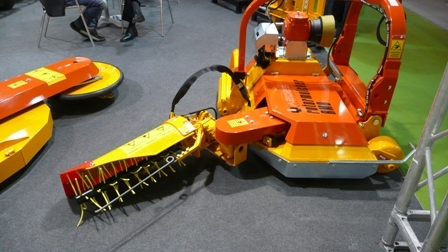 We saw the efficiency of the self-propelled platform we jokingly called "the Octopus" - "I admire the Italian farmers for being quick to adopt new technology as not so long ago the Octopus was 'just' a nice idea but it appears it is now omnipresent in modern intensive orchards". 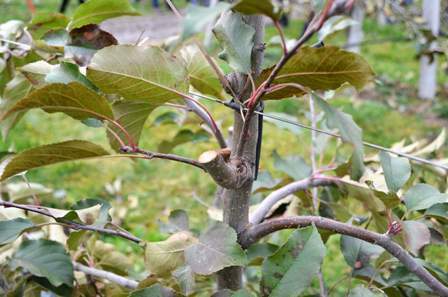 "One block of younger trees had just been pruned and branches trained below horizontal; I could see the good old bench cut rather than the 45 degree Dutch cut for renewal pruning"
It does seem a bit strange to see Pink Lady apples being picked, while in nearby orchards varieties like Gala may have completely lost their leaves. 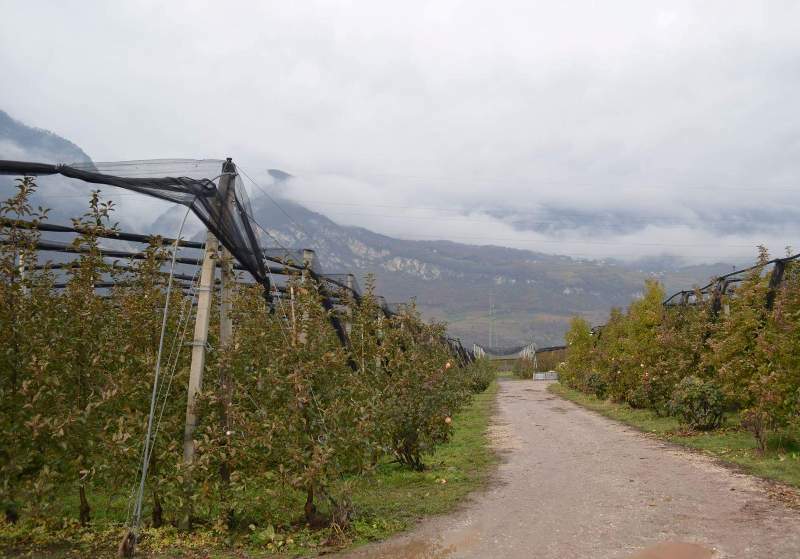 Apple orchard at Vinschgau and Cooperative visit (Vi.P). 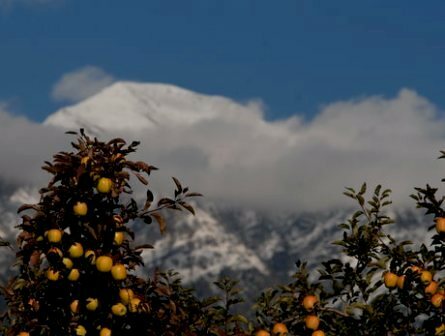 Vinschgau - a piece of nature in the Alps with a special microclimate responsible for the exceptional taste of apples Val Venosta. 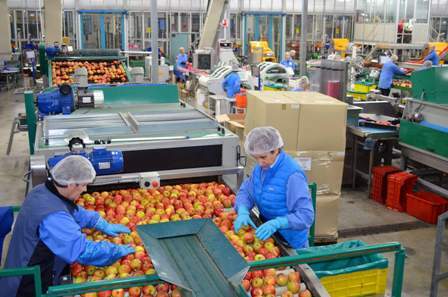 The apple production areas begin at 500 meters and continue up to 1,000 meters to meet the needs of different varieties. 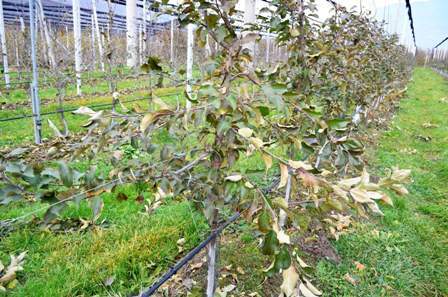 "The orchard was at higher altitude (~1000 metres) than valley floor on other visits. Most of plantation was Golden delicious, however, it was the terrain that was fascinating and reminded me of home in the Himalayas. The grower confirmed that the site was bulldozed into a gentle slope decades ago and the average rainfall in the area was low, therefore, the farmers of the valley got together to source water from mountains nearby"
"The highlight of this highland tour was the giant packing, sorting and warehousing facility we visited at the site of GEOS cooperative (established 1946) that is part of the bigger umbrella association called Vi.P. 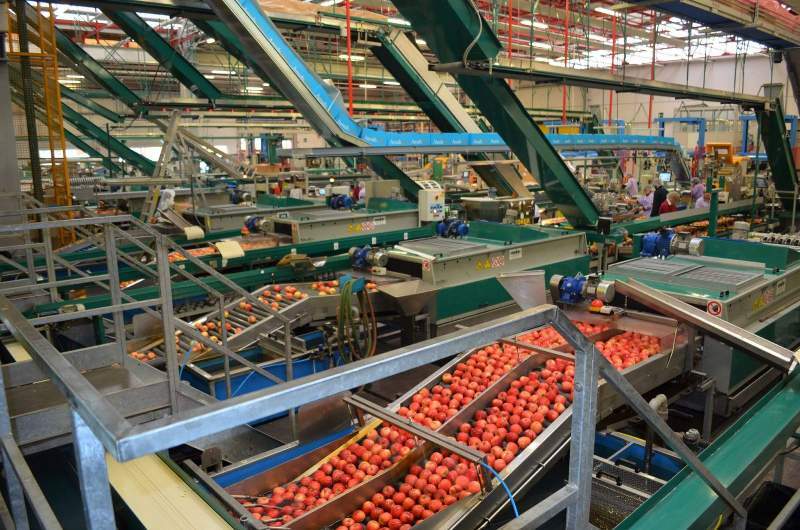 Geos has 300 members (growers) who cultivate 960 hectares and 140 employees. The new warehouse/sorting/packing facility is spanking new and only opened two days before we visited. 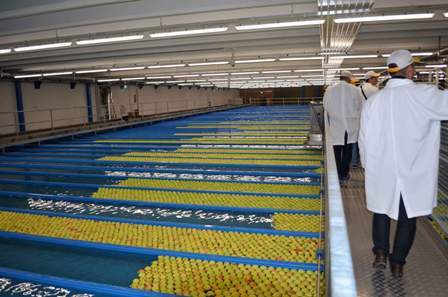 The sorting line has 10 lanes and 70 dynamical exits with capacity to sort 425 tonnes of fruit per day. The highlight of the visit was the fully automated high bay warehouse that was 28 metres high with capacity to store 17,000 bins (5000 tonnes). 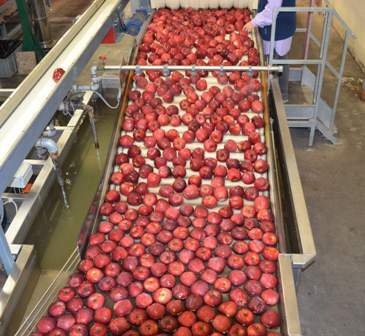 The eight rack feeder allows robot trucks designed to fetch apples of precise specification, in lots of three bins, without a human being going inside the warehouse. The warehouse was built at a cost of about 9million Euros (partially EU funded). The warehouse technology matches the industrial scale warehousing systems I have seen in commodity supply chains in steel and lubricants industry. 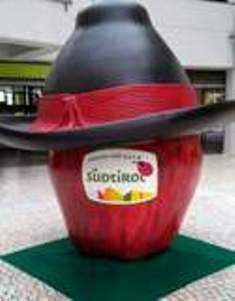 I never thought this could be used for humble Apples. 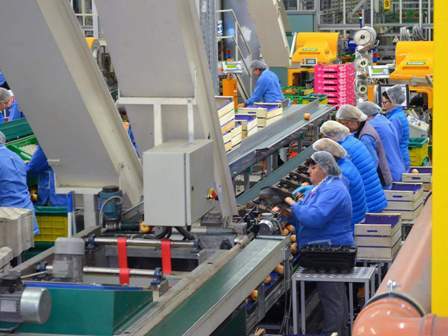 The packhouse was equally impressive with 13 packing lines, automatic labeling and palletizer, integrated weighing system, production planning and traceability with Top control fruit manager. It can pack 300 tonnes per day. 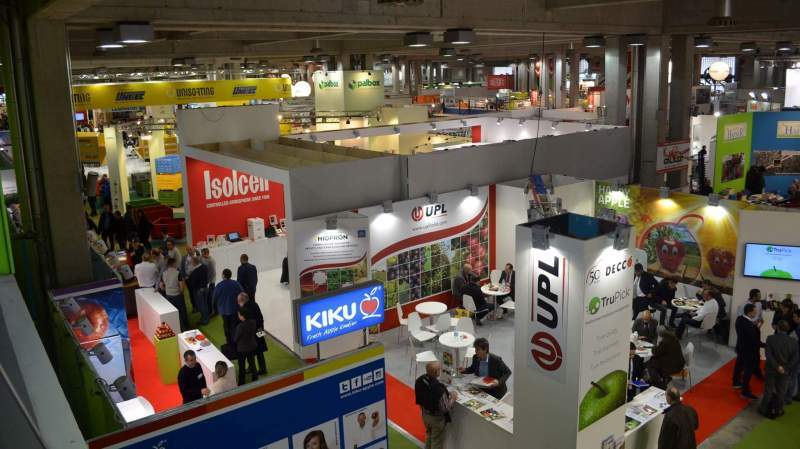 Talking to my good friend Simon Bray this week about his impressions of Interpoma 2016 - I asked what stood out in his memory from last week; he said that new strains of Gala, Red Delicious and Breaburn have such high red colour that they tend to be indistinguishable from each other. 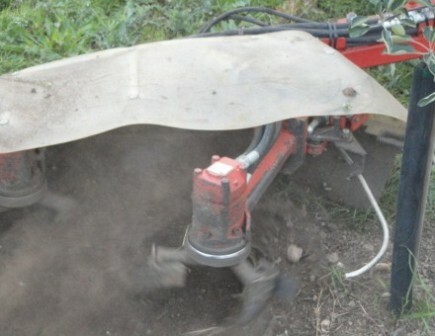 The other clear trend is away from using herbicides to control weed beneath the trees, towards ever more sophisticated mowers and cultivators. These units move gently around the tree using touch sensors. 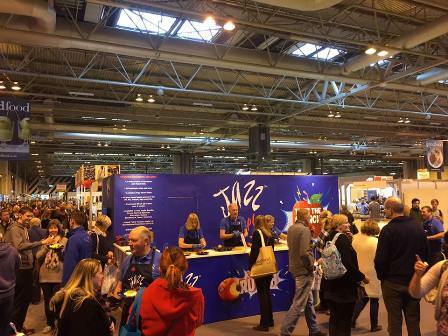 Sampling Jazz apple at the BBC Good Food Show, NEC, Birmingham.
" 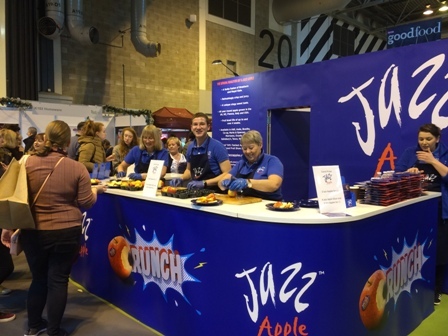 We were very busy all day Saturday, with a high number of apples sliced & sampled by the public. As you can see 3 people slicing & just about keeping up"
"Fruit ate very well, crisp and good flavour. Very well received. High majority of customers aware of name & buy regularly. Keen to buy English Jazz"